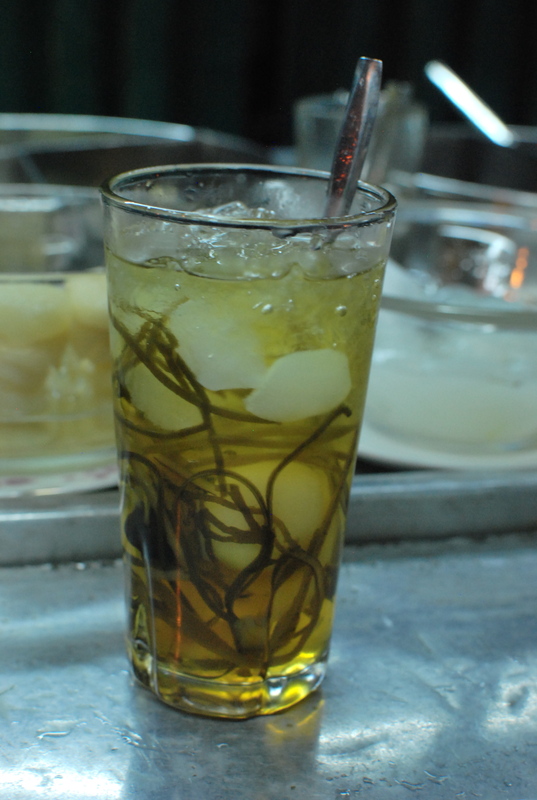 My mind turns to the refreshing delights of my days in Saigon…and how I thirst for just a sip of that goodiness right now. Now, you may have heard of or be like me, have many times over, in your life, turned into an utter fool for “Chè”, not the tea, but the dessert. It could be anything from well-cooked green beans soaked in sugar to a blend of syrup-drowned fruits, nuts and jelly,served either hot or iced. 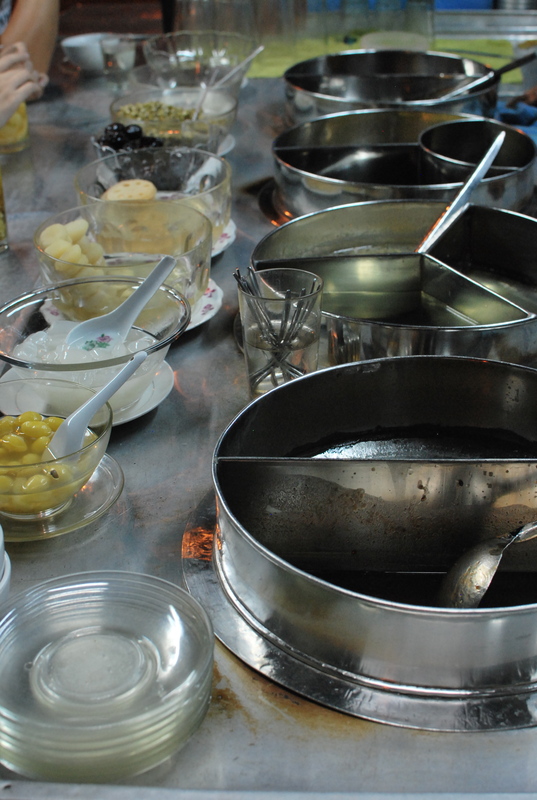 The topic of this much loved dessert would take countless days to cover, since it could be practically any number of combinations of sugar-related dishes in Vietnam. In Saigon, however, amidst the culinary adventure on which I and my palate fully and ever so often engage and yet fail to fully report on, I discover a genre of ‘chè’ known as ‘sâm bổ lượng” – Pardon my Vietnamese, linguists out there, but my rough understanding after enjoying this once or twice, is that it’s a ginseng drink that is absolutely scrumptious and healthy, and it gives you a boost on metabolism. No, it’s not “Redbull” in disguise. From my conversation with the vendor who happens to be of Chinese ancestry, this type of dessert is a Chinese treat brought to the southern metropolis by communities moving southward to settle. Beyond simply cooking different types of fruits and jelly, and letting it candy up and soak in sugar syrup in the case of many types of typical Vietnamese “Chè”, this ginseng refreshment uses ingredients that would be more known to Vietnamese people in a mixture of Chinese traditional medicine such as: ginseng, dried seaweed, ginko nuts pearl barley, dried dates, dried longans…etc (Below is a sample of some ingredients) . This makes it all sound so healthy…and my so far-done research of this drink is way too scattered to affirm this…yet my palate and I will attest, the ginseng flavored syrupy broth, coupled with the subtle differences in texture and taste of the ingredients involved, makes this drink definitely a worthwhile delight to try out. I find that it doesn’t have the ‘heaviness’ or ‘overwhelming sugary’ feel of some other types of Chè that includes further extraction of the fruits and beans into the broth. In contrast, it’s light, only slightly sweet, savory in texture, and refreshing in taste. It’d become nothing short of a culinary enigma if I attempt to describe any more. 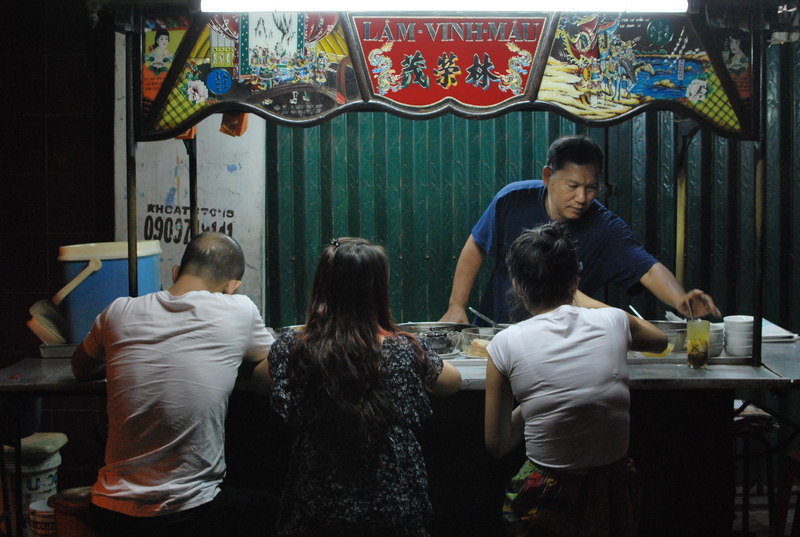 These carts, the owner, in his 50s and a 3rd generation Chinese expat, says are typical for vending desserts and other goodies back in the heyday of the “Cho Lon” – Chinese-populated era of Saigon. His cart dates back to the 1930s, I believe and his family has been in the business since he can barely remember. After the passing of his wife, my friend shares, he had been fully dedicated to perfecting the trade, all from the comforts of this cute little cart, amidst the bustling chaos that is Saigon life. He’s a journalism story in the making and I have plans to learn more about this man and his cart, of which I’ll share, and yet I digress, as this post is about FOOD…Anyhoo, it’s roughly around 175 Nguyen Thai Binh I think, a cart with aluminum cylinders of brewed delights ready to be mixed in with a range of different ginseng and sugar syrup. I’ve only had the drink several times, not nearly quite enough, but what I can definitely notice is the clarity and lightness of the broth here compared to the place I tried in District 5 – Chinatown. How I would fly to Saigon just for a glass right now…!!! PS: updates will be given to fill apparently huge gaps in the knowledge that I have about this delight. From what I know, Sam Bo Luong is but one…as this cart alone features many other types of ‘che” known through names that I fail to register in my head…ones that even include full eggs boiled in sugar (sounds weird yet enticing). For now, just take it from me that Sam Bo Luong is amazingly the best summer refreshment I’ve enjoyed so far, and you should go try it! Enjoy!